Clive and Pete opened up on a very wet pitch at Wantage and Grove. Several strips along it was even wetter, so I think we were lucky to play. Pete went quickly to a great parry then grab behind his back by the first slip. Peg got done by a ball that held it's own and found the outside edge of his bat. Meanwhile Clive had been trying to nurdle his way to a few handy runs, but when Tim came in to bat the match changed dramatically. Tim started hammering the ball to all parts of the ground with enormous force and with Clive trying to give him the strike at every opportunity the run rate soared. 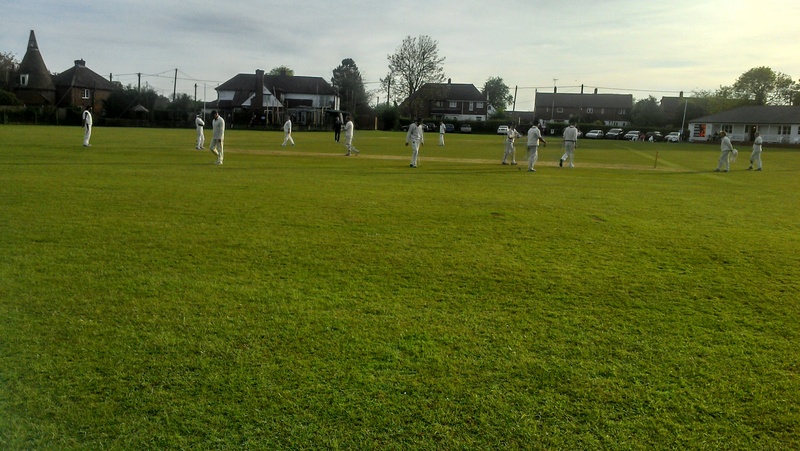 Tim, definatley rode his luck and it finally deserted him as he misscued another lofted drive back to the bowler. Steve Rogerson played a few lusty blows at the end, and Glen hit a famous six which landed on the boundary line. In truth though the innings faded badly after Tim was out, and a score of 162 in 35 overs looked as if it might not be enough. A do it yourself tea was followed by the Wantage innings and even though the first opener fell fairly cheaply , the other opener went on to hit a well deserved century. He was dropped a few times along the way, so we only had oursdelves to blame for what turned out to be a fairly comforatable win despite a few late wickets and much debate about whether the retired centurion ccould come back if he needed to.